The raspberry flavor is perfect in this rich silky ice cream. By straining both the raspberry purée and the custard base separately before combining them you end up with pure smooth deliciousness. I used just picked raspberries from the garden and I think that also helped ensure the amazing raspberry flavor. 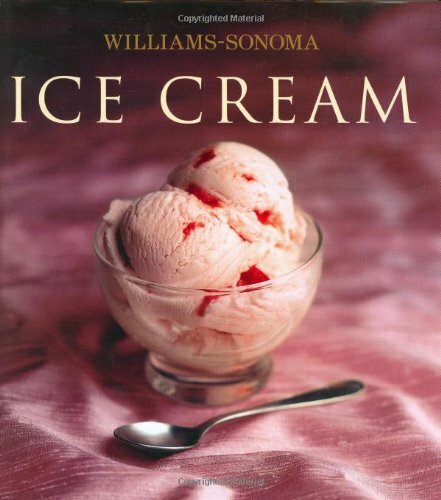 Cookbook buyers have shown a huge appetite for the Williams-Sonoma Collection. By combining hundreds of hours of consumer research, a fresh editorial concept, and an eye-catching package, the Williams-Sonoma Collection has created a new benchmark for illustrated cookbooks. The contemporary yet classic design, high production values, and mouthwatering photography work seamlessly to showcase dishes to satisfy every palate, from nostalgic comfort food to inspired new ideas. Ice Cream offers classics of Vanilla Bean, Orange Sherbet, and Baked Alaska, as well as fresh combinations like Green Tea, Avocado, and Cranberry Sorbet.